Don't be fooled by its good looks. This Hobby Press is the best in its class! Light weight, easy to use, safer swing out design, and good looking too. 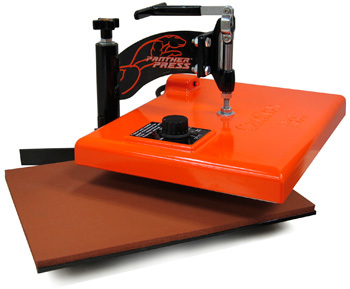 The Panther Press is light on its feet, at only 20 LBS it's the most portable press on the market today. Economical, perfect for the hobbyist who wants to apply inkjet, laser, sublimation, flock transfers, rhinestones, etc. IMPORTANT: This press can hold a stain resistant pad protector for the lower base. Some 9"x12" Models on the market cannot!